Ever feel like you're just punching the clock, day after day, working to barely pay the bills and for those brief moments of respite on the weekends? Photo by Tom Blackwell via Flickr. Glassdoor says the North Texas job market is still hot. Lots of people are moving to Dallas for work, according to the observable and growing number of bad drivers I like to assume are transplanted Californians for the sake of in-car comedy routines, and to a new study from the job-finding site Glassdoor. A population boom in Dallas-Fort Worth is not a new story. An alleged low cost of living, no state income tax, growing suburban areas, yada yada. Jobs have always been one of the biggest parts of that story—people mostly don’t come to Dallas because it’s cool to live in Dallas, although business leaders here are trying to change that perception. 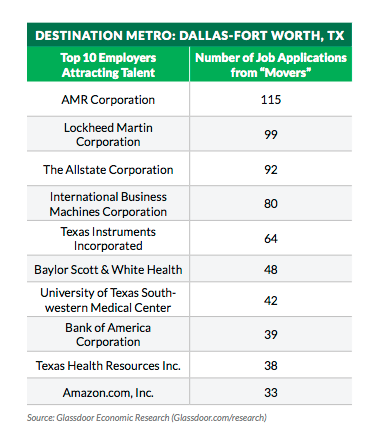 But the Glassdoor study does have some interesting details on where these “metro movers” are coming from, who they’re going to work for, and why they’re happy to move. The Glassdoor researchers contend that a metro area needs a few things, or at least one of a few things, to attract job-seekers. A red-hot industry (see industry, tech) helps, as evidenced by the growth in San Francisco, San Jose, Seattle, and Austin. Being big centers of culture and commerce in the first place helps: New York and Los Angeles are not hurting for newcomers. And some of it’s a matter of geography. As a metro area, North Texas’ closest competition is at least a three-hour drive away. …most job candidates prefer to stay close to home. So candidate pools for most jobs will typically be comprised of local applicants. For employers choosing locations for new offices and facilities, it’s important to look beyond monetary factors like taxes and real estate costs. Employers should consider the local labor market and whether it contains the skills and education they’ll need to hire, because most job applications will be coming from the nearby labor force. …some jobs are better able to attract talent from outside metros than others. Applicants for tech and engineering roles on Glassdoor are most willing to relocate for jobs. However, applicants for many lower-skilled roles in retail, food services and some blue collar jobs are unlikely to apply to jobs outside their home metro — these are jobs employers will have to make a special effort for if they wish to recruit talent from more distant metro areas. …when it comes to enticing applicants to relocate, we find strong evidence that both pay and company culture matter. However, good company culture matters much more to applicants than pay — an employer having a 1-star higher overall rating on Glassdoor can expect to attract a metro mover at about six times the rate of employers paying a $10,000 higher salary, based on our estimates. As we’ve shown in past research, pay matters for talent attraction, but it’s statistically often a less important factor than having a strong employer brand. …women and more experienced workers are less likely to apply to jobs outside their home metro, even after controlling for factors like education, pay and job titles. 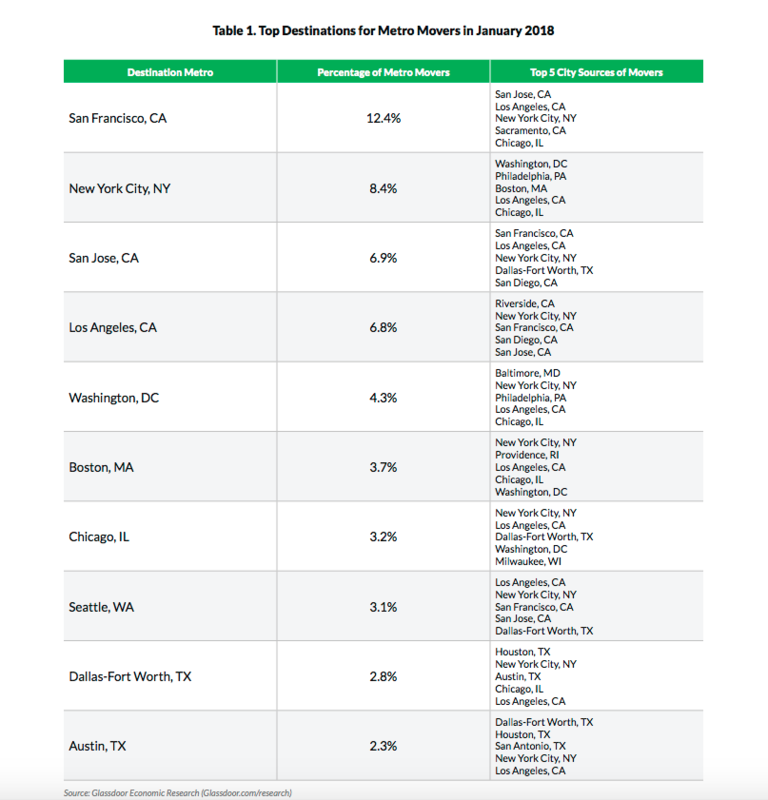 For employers looking to hire specialized tech and engineering jobs that attract the most metro movers, this suggests employers will face less diverse applicant pools on average unless they specifically recruit women and more experienced candidates. This is an often overlooked cause of applicant pools that lack diversity — something employers can overcome by targeting outreach efforts at these under-represented groups when hiring nationally for specialized roles.